We all know that taking an Epsom salt bath is beneficial but sometimes we take it for granted and forget to make use of it. Let us take a closer look at these benefits so we will be inspired to regularly bathe in Epsom salts. Epsom salts are loaded with magnesium and research has shown that while we can ingest magnesium supplements, this element is not easily absorbed by the digestive tract. It is, however, easily absorbed through our skin, making an extended dip in a tub the best way to absorb it. The benefits of absorbing magnesium include, but are not limited to, an increase in our body’s production of serotonin and increases our energy levels. Another benefit of the proper absorption of magnesium through Epsom salts is the regulation of electrolytes in the body. With regulated electrolytes, our muscles, nerves and enzymes function properly leaving us less prone to cramps and muscle exhaustion. Calcium is also properly regulated when there is adequate amount of magnesium in the body. There should be a balance when it comes to the amounts of calcium and magnesium in the body for the entire muscles mass to function properly. Aside from magnesium, other benefits of soaking in an Epsom salt bath are the increase of water in the colon and helps flush toxins from the body. The salts increase water in the colon which in turn acts like a laxative for the proper disposal of body waste. Epsom salts also contain sulfates which are essential in flushing out potentially toxic elements and heavy metals from our bodies. Soaking your tired feet in warm water with dissolved Epsom salts can also relieve tiredness and helps to manage foot odor. The principle of these kind of salts helping relieve sore muscles is the same with relieving tired feet. It is not only the physical aspect that benefits from a soak with these salts. The absorption of magnesium can help to ease tension due to stress, relieve a migraine and helps a person feel relaxed. 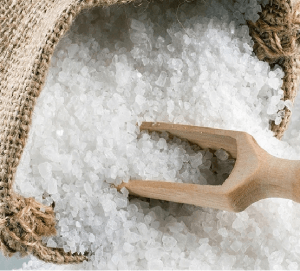 When you are stressed, magnesium levels go down, by soaking in Epsom salts, you increase the levels of magnesium in your body, thus relaxing both your muscles and your mind. When you are physically relaxed, the mind follows and you will feel so much better. The production of serotonin not only affects you physically but mainly affects your mood and overall feeling of relaxation. You may also be less irritable when you regularly soak in an Epsom salts bath because of the absorption of the magnesium ions which lowers the side effects of adrenaline. The same ions also help you sleep better and be more at ease. These are just a few of the many benefits of soaking in warm water infused with dissolved Epsom salts. Many people who soak regularly claim that they not only feel better but they also look better as well.